A few weeks back we had heard Victor Cruz speak about his signature shoe being on the way. Well it looks like we didnt have to wait too long for a pic to surface as a singular pic hit the internet via Instagram. Right from the start you get a "Bo Jackson meets LeBron James" kind of vibe that somehow fits extremely well as the sneaker takes the lifestyle route. Seemingly butter soft black leather adorns the forefoot and thick strap while the celebrated Safari print covers the toe and heel strap. The shoe's real calling card seems to be the faux spiked middle and back of the upper which hints at the LeBron 11 NSW Lifestyle as well as the black/grey/red colorway that is similar to the sneakerhead favorite Air Jordan 3 "Cement". The midsole and outsole are pretty interesting as the Air Trainer 1's bottom tooling is given a milky translucent outsole, giving the shoe a different look than any in-line make up of Bo's shoe that has released to date. What do you guys think of Vic's tentative first sig shoe? Its evident that his sense of fashion as well as his love for other kicks has played into his own sneaker's design. We've spotted the different models that seemingly make up this pair but do you think you can spot them all? Let us know in the comments below. 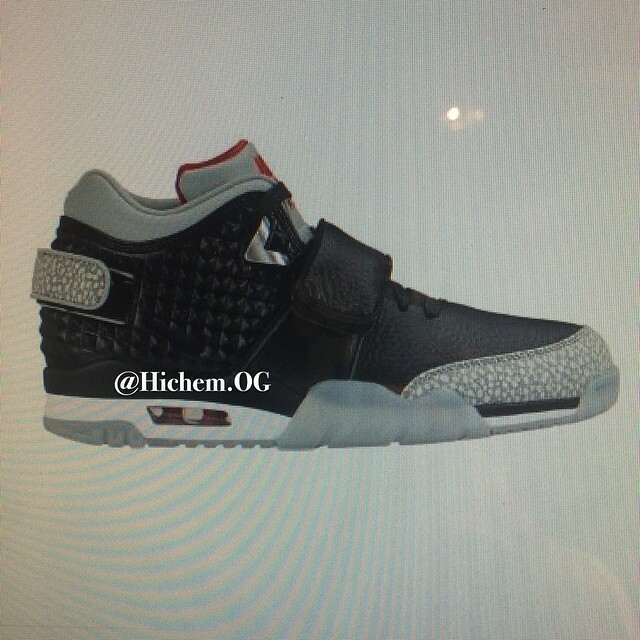 Also make sure to keep it locked with SneakerShouts for updates on this exciting model.